The new and improved version of Singing For Dummies offers a fun and easy way to learn to sing or improve your singing voice and vocal technique at your own pace. Your personal vocal coach is a professional voice instructor who guides you through over 80 step-by-step lessons with over 30 full-motion videos and animations. The easy-to-follow lessons show you how to sing in time and in tune, use proper singing technique, and develop and project your voice. eMedia's Interactive Feedback technology along with newly added Performance Evaluations actually listens as you sing and shows you whether you are too high, too low, or right in tune! The over 35 songs are available as live recordings for male & female voices in both high and low ranges to better suit your voice. It's fun to sing with a pianist accompanying you, so we've included professionally arranged live piano accompaniments along with MIDI versions that can be slowed down or sped up. Song looping also lets you select and repeat any particular section of music you may wish to practice at a slower speed. Private lessons from an instructor of this quality would cost many times more than this interactive software. 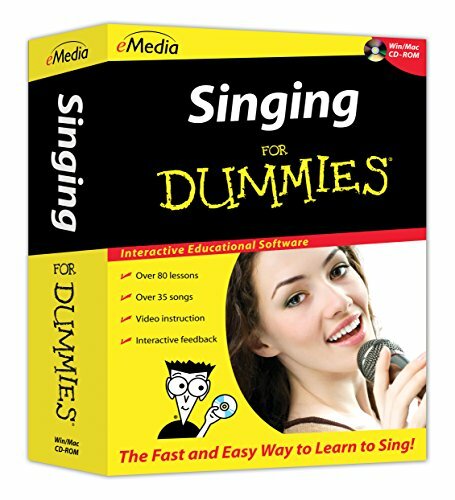 eMedia Singing For Dummies is an exceptional value that will quickly get you singing with confidence. Interactive feedback tells you whether you are too high, too low, or right in tune!